Native to the Mediterranean Basin, olive trees (Olea europaea) are slow-growing evergreen trees known to last for centuries. Maturing about 30 feet tall and equally wide, olive trees develop a rounded but then irregular crown of branches and foliage. Their brown trunks become twisted and knobby. Olive trees grow outdoors where winters are not colder than 15 F and soil is extremely well-drained. Climate must mimic that of the Mediterranean: hot, dry summers and cool, damp winters where the soils never become overly wet. The American Horticultural Society's "A-Z Encyclopedia of Garden Plants" lists olive leaves as elliptical to lance-shaped, while "Sunset Western Garden Book" simply refers to them as "willow-like." Each leaf blade is up to 3 inches long and between 1/2 to 3/4 inch wide. Keep in mind many cultivars exist and mature size of leaves vary based on each cultivar's genetic nuances compared to wild olive trees. An olive leaf is thick and leathery in texture. Edges of the blade often have irregular but small teeth. 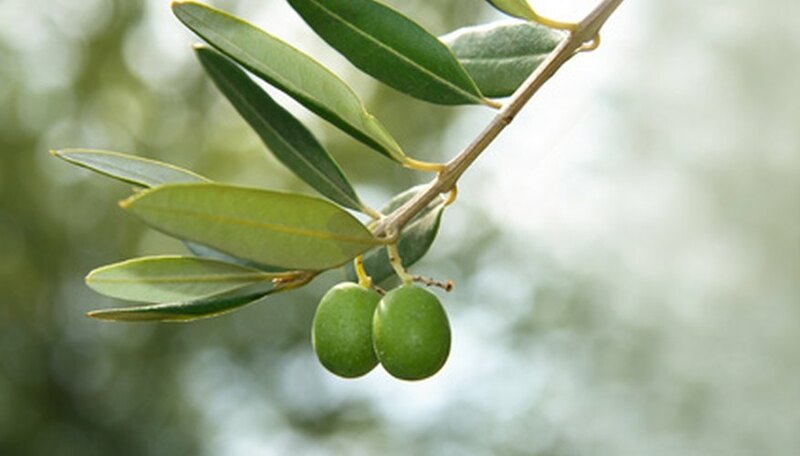 On the branches, olive leaves are arranged in opposite pairs. The underside is covered in trichomes, according to the U.S. Forest Service. Trichomes are hair-like cells that coat the leaf epidermis. Overall, olive leaves impart a soft pale green color to the tree's canopy. The upper side of each leaf is deep gray-green, while the trichomes on the leaf undersides create a silvery gray color. In similar manner to leaf size variability in olive cultivars, leaf color varies, too. For example, "Sunset Western Garden Book" notes that selections Little Ollie and Swan Hill develop leaves with much darker green leaves with silvery undersides than other trees. Olive trees are evergreen but leaves are shed as they age or energy resources are relocated to produce new spring growth. The U.S. Forest Service states an olive leaf persists usually for two to three years before it is shed in spring about the time the flowering season starts. Older leaves exist across the tree and weather can affect how long some leaves are retained before dropping away to the soil to decompose. Traditionally, olive leaves and sprigs symbolized peace in the Mediterranean region, and this remains today. According to the University of Wisconsin at La Crosse, gifts of peace symbolized by olive branches with foliage arose during war times. Since olive trees grow so slowly and take numerous years before providing fruits, an olive sprig implied a peaceful era when ample time existed for the tree to grow. Do not confuse the narrower olive leaves with those of another classic Mediterranean leaf decoration: bay laurel. Laural wreaths, headdresses and sprigs symbolize power and fame. Laurel leaves are much broader and more oval-shaped than those of the olive.